In this quiet period of the year, between Christmas and New Year, when the usual rhythms and routines are suspended and there is a lull between celebrations, I like to reflect on the year just ending and look forward to the twelve months to come. This year I am excited to have this space to record these thoughts where they will stay for me to look back at when the mood strikes me. There has been much happening on the world stage in 2016 but this little bit of the internet has always been where I share about my life and so I think that is what the review of the year should be too. There has been a lot of change for me this year. Some of which I didn’t see coming as I sat reflecting upon 2015 and looking forward to what 2016 may hold. This time last year I was planning a break from the small amount of work I did facilitating antenatal education for expectant couples through a large parenting charity. In February I met with my last group of parents, then holding their new babies and decided to hang up my pelvis for a while. I am now doing a minute amount of volunteering for a different charity but looking back over 2016 I find I haven’t really missed the birth work that was a big passion of mine in previous years. Also in the parenting sphere, I began 2016 in my third year volunteering with my local sling library providing support and advice to parents who wanted to carry their babies and I stopped doing this in the spring time too. I think as my children have grown I am also growing away from working with people at the beginning of their parenting journey. An unexpected, but hugely welcome, consequence of reducing my commitments outside of the home has been the explosion in my creativity levels this year. I have a draft blog post which I have been mulling for weeks now on the subject of my burgeoning imagination but it is safe to say it blind sided me! There will be a creative review of the year, in pictures, in this post, but first, the wordy bit. As a full time parent to three young children it is vitally important to me to maintain an identity and sense of self beyond mum (or mum mum mum mum mum mum mum mum mum as I am more commonly known). When I gave up my paid work in the first quarter of the year I didn’t know what would take its place in fulfilling this role, it transpires it has been making things! I did not start the year intending to start blogging. It has been something which has been at the back of my mind for several years but I worried I had nothing to say. I have always enjoyed writing though and so in early August I launched here with little idea of what it would be. It has mainly been crafty bits interspersed with other little things I wanted to say and I have been surprised to have gathered a small following of regulars who read and comment (hello, I really appreciate seeing you here). I have really enjoyed joining in with the Yarn Along most weeks and meeting other bloggers, seeing what’s going on in their lives, WiPs and harvesting book recommendations. I’ll let Goodreads do the work of providing my year of books for me. But in summary I came out at 48 books totalling 17876 pages. Click through here for the full list Goodreads Year in Books. Of course I couldn’t review the year without mentioning my shop. As late as halfway through the year I wouldn’t have believed anyone who said by the end of the year I would be crafting original pieces of art and people would be paying money for them. It’s all part of the aforementioned creativity explosion! But here we are. In September 2016 I launched a little store front on Etsy. I held a giveaway on facebook for publicity which garnered 207 entries and have now made 6 sales. I still need to pinch myself writing that. On the home front we moved house which took a lot of mental energy through the year from the first talks about moving here in May through to the actual moving stuff in October. It is a beautiful setting and has changed our day to day life a lot moving from the city into the countryside and I expect it will colour many of our 2017 experiences. My husband’s work has been uncommonly stable with him staying with the same contract for the whole year, I suspect this stability will have helped me to make such big changes this year. And my youngest child turned 5 propelling us out of the baby/toddler years and into what I have seen referred to as “the middle bit” between tots and teens. Well that turned out longer than expected! On to the makes! I started 2016 by making a Pinterest board where I could store photos of of all of my makes in one place which is making this a much easier task than it could have been! Although it does get a bit loopy in places because the pins are linked to this blog (which I am now linking to the pins, which link to the blog…) Anyway it’s here! I made ten hats throughout the year. Starting with a strawberry baby hat in January (inspired by this pattern but modded by me), a green Pixie rib hat (pattern here), four of the Over The Rainbow hats, the sunflower hat I blogged about here, more rainbows for new babies more info here and two Baa-ble Hats finished just a few days ago. Then there were two shawls. Read about them in my Ready for Yarndale and Jewel Rainbow Breathe Shawl posts. I made my children a birthday cake apiece. And a flat rat bookmark, frankensteins monsters mini head, bunting to decorate our tent when we camp, a little heart house warming gift, three little flowerpots, a wall full of snowflakes, a midwife, a sheep and carved four halloween pumpkins… phew! I suppose batsnail could have fit in here, but I think he deserved a special mention! But if I were to define this year with one word, it would have to be wreath! Not only the very centre of my creative year but probably the word that best sums up the year as a whole, encompassing as it does the first projects I designed myself, the first patterns I wrote and also the first product I managed to sell. And seven of the little wreath dwellers as gifts for friends! And so that was my year! Congratulations for making it this far, it turned out a lot longer than I originally intended but it feels rather productive all set out like this! On my kindle The Essex Serpent by Sarah Perry. On my hook an Attic24 Sunny Log Cabin blanket square. This blanket was Lucy from Attic24‘s 2015 Crochet Along. My lovely motherinlaw bought me the yarn pack as a Christmas gift last Christmas, 2015 and I excitedly started making the centre pieces for the squares by fairy light while munching Christmas chocolates before 2015 was finished. But as we moved into this year and i started on the constant colour changing needed for the log cabin parts of the squares my enthusiasm waned. With two of the sixteen blocks completed the blanket moved into hibernation in early February and I moved onto learning socks! After the rush of getting Christmas gifts ready I found myself without a project on the go and reluctant to start anything new. So I’ve dusted off the bag of yarn and this is my progress on square three. All of the colours needed for this blanket stop this from being a portable project and I quickly remembered why I put it down first time round. But I really love the look of the finished blanket and so I will not allow it to be neglected again. I might pick up other projects between squares but I will finish this blanket in 2017! I walked into a Waterstones book shop a few days before Christmas and there was a big display of The Essex Serpent which they had named their book of the year. So I’m giving it a try. The writing is beautiful and the story engaging and I am enjoying reading it. Linking up today with Ginny and the other yarn alongers sharing what they are reading and working on. I love making things. And I love gifting them. When I heard about Perfect Strangers from a friend of mine on Facebook it sounded right up my street. So I signed up. You can find more information about them here but in a nutshell you sign up and get paired with a Perfect Stranger. You then prepare a parcel for your stranger and hope that you get one back. What’s not to love! Looking at their website it would appear to be a mainly UK initiative with most participants in this swap from the UK but there are people involved from 54 different countries this festive season. I have a partner from Scotland and this was what I prepared for her. She told me in her introductory note that she was an avid reader and fan of Frankenstein’s monster so I made a book mark and teeny monster to go in with the gifts I purchased which included a book (obviously), a cute little notebook, some bath stuff and a stack of sweeties. The book mark is a fabulous free pattern you can find at Superguruami. I made mine with DK weight yarn as it is what I had around and he worked brilliantly. The little Frankenstein’s monster was a pattern I made up as I went along adapting my teeny tiny owl. I did scribble down some notes as I went so he may make a reappearance closer to halloween. I’m quite pleased with how he turned out even if his scar is a little Harry Potteresque! And then my box arrived in the post! I told my swap partner that I was a big fan of the outdoors and changing seasons and making things and this is what I received. The accompanying note told me that this was her third year doing the swap, I’m already looking forward to taking part next year! What a gorgeous selection of thoughtful gifts. I feel completely spoiled and so thankful. The notebook and bracelet are especially wonderful. They are perfectly to my taste and I love them so much. I only hope that my swap partner likes her box too. On my needles this week, nothing! On my kindle, Tender is the Night by F. Scott Fitzgerald. I thought about not participating in the Yarn Along this week but then decided it would be an exercise in accountability to post here about this project. Twice I have cast on this hat. And twice I have frogged it back. The first time because I was worried it wasn’t big enough (turns out it was) and the second because an inaccurate stitch count on the first round messed up the ribbing. I am aiming to make two, perhaps three of these hats for Christmas gifts and so I really need to push on with the knitting rather than blogging about the lack of knitting progress! I heard author David Nicholls on the radio a few weeks ago talking about his favourite books and he mentioned how, in his opinion, Tender is The Night is a far better novel than Gatsby. I’m investigating that claim for myself. Although very slowly. Having read all three books in the Chaos Walking Trilogy by Patrick Ness over the course of many late nights last week I’m taking this one at a more leisurely pace. If you are a regular visitor here then you will have seen these socks before. More than once. As part of Yarn Along. In fact they have featured in no fewer than four Yarn Along posts! My Ravelry Project Page for these socks tells me I cast them on on the 17th September, a mere 12 and a bit weeks ago. Eeeeeeek! Before we moved house even! They haven’t actually taken that long really (is the story I am telling myself). I’ve made quite a few things in that time alongside the socks and I suffered quite badly from second sock syndrome for a while so I suppose its not that bad. I always intended these socks to be a present for my Gran, who’s birthday it is today. I finished them last night after the light had faded and couldn’t photograph them so technically they were ready in time. By the skin of my teeth. But I actually posted her a different gift and will send these down for Christmas instead. I hope she likes them. These were my first attempt at a lace patterned sock and the 6th pair of socks I have made this year. And I’m really pleased with them. The pattern is a nice simple repeat so perfect for my first attempt at fancy socks. The yarn from the West Yorkshire Spinners sweet shop shades range of signature 4 ply is absolutely yummy. It is my very favourite colour and has been a dream to work with. Its called Blue Raspberry. So yummy that at several points over the last 12 weeks I have considered keeping these socks for me! Fortuitously there is 35g left from the ball now that the socks are complete so I think I can probably squeak a hairband or something out of whats left for me to keep and treat myself. Once I’m all caught up on my other festive gifts of course! On my hook a glove in progress. On my kindle The Ask and the Answer by Patrick Ness. This week I am pattern testing for my good friend Purple Pixie Crochet The pattern is for really adaptable gloves so from the same pattern they can have a variety of finishes. I think mine will be convertible mittens, perfect for texting and pokemoning! I’ll be back with more details when the pattern is released. Again I’m reading the same ish book as my husband is listening to the audio book version on his commute. I say ish as I have raced ahead and am on the second in the trilogy while he is still on the first. Last weekend we went to the cinema to see Fantastic Beasts and Where to Find Them and there was a trailer for A Monster Calls which took my breath away. I read the Patrick Ness book on which the film is based last summer in one sitting, curled into a sobbing ball of emotion in the corner of the sofa. It is an amazing read. Anyway seeing the trailer reminded me of it and I thought it might be a good idea to read more Patrick Ness. The Ask and the Answer is book two in the Chaos Walking trilogy and while they aren’t quite A Monster Calls the first book, The Knife of Never Letting Go, kept me up way past my bedtime two nights in a row before ending on a cliffhanger that sent me straight into book two. Which is annoying because I have a long list of craft projects to tackle before Christmas and could do to be without a gripping trilogy filling my time and thoughts! 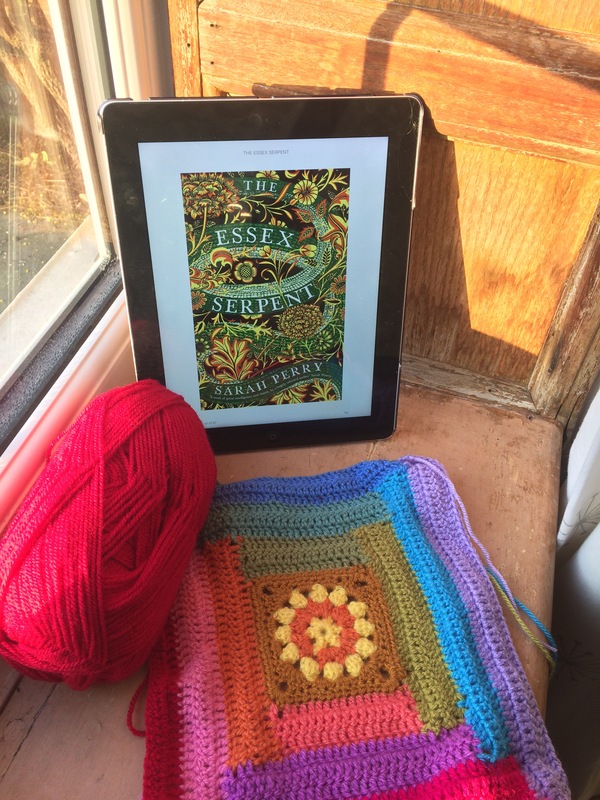 Linking up with Ginny and the other peeps in the Yarn Along sharing what they are reading and working on.